If you have had a cardiac event like a heart attack, then you may benefit from a 4 step cardiac rehabilitation program. Cardiac rehab involves care from a multitude of healthcare professionals including your doctor, nurses, and rehabilitation specialists. A physical therapist is one health care professional that you will likely work with during cardiac rehab. Phase 1 cardiac rehab starts in the hospital. There you will likely work with your physical therapist to recover basic functional mobility. You will also learn techniques to monitor your activity level, and if you have had open heart surgery your PT can help you manage your sternal precautions. Once you leave the hospital, you can engage in phase 2 cardiac rehabilitation in an outpatient clinic. You still may be having difficulty with functional mobility, and your physical therapist will work closely with you to ensure a smooth transition into outpatient rehab. Phase 3 cardiac rehabilitation is the next step in the continuum of physical therapy after a cardiac event. Phase 3 cardiac rehab involves more intensive exercise and activity while you continue to monitor your body's response to increased workloads. Phase 2 cardiac rehabilitation involves structured and closely monitored exercises and activities. As you progress through phase 2 and into phase 3, your physical therapist will prescribe more independent exercise and activity. You are usually ready to start phase 3 cardiac rehab when your vital signs, such as heart rate and blood pressure, remain stable as you increase your activity and workloads prescribed in the sub-acute phase of cardiac rehab. Your doctor and physical therapist will work closely with you to ensure a safe transition into phase 3 cardiac rehabilitation. During your initial evaluation in phase 3 cardiac rehab, your physical therapist may also choose to perform a specific outcomes measure. These measures provide your PT with an objective measure of your functional mobility. Typical outcomes measures used during phase 3 cardiac rehab include the 6 minute walk test and the timed up and go test. Your physical therapist will also ensure that you are fully capable of monitoring your own exercise and activity intensity. These techniques may include using the Borg scale, learning to take your heart rate, or using a heart rate monitor to assess exercise intensity while working out. Your PT may also teach you the simple talk test to monitor your activity level. Phase 3 cardiac rehabilitation often occurs in a group exercise setting. This may have specific benefits as you will be able to socialize with others and see how others are progressing with their own cardiac rehab. Group therapy can also help keep you motivated during phase 3 cardiac rehabilitation. As you progress through phase 3 cardiac rehab, your physical therapist will likely give you more and more independent exercises and activities. This is done to prepare you for phase 4 cardiac rehabilitation: independent exercise and lifestyle modifications. 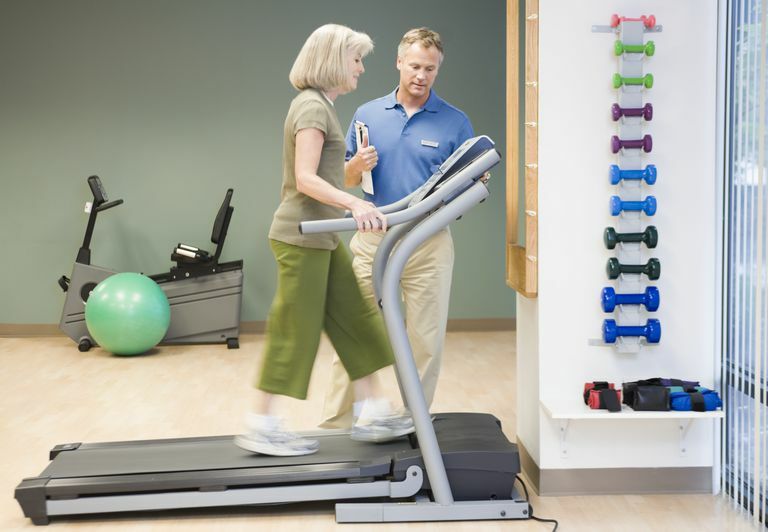 How Long Does Phase 3 Cardiac Rehab Last? Typically you will spend three to four weeks participating in phase 3 cardiac rehabilitation. Your physical therapist will ensure you progress safely through the program with the ultimate goal of having you move on to independent exercise in phase 4 cardiac rehabilitation. Phase 3 cardiac rehabilitation is one step in the continuum of care that you may experience after a cardiac event like a heart attack or open heart surgery. By participating in cardiac rehab and working closely with your PT and doctors, you can be sure to return to a healthy lifestyle. Sandesara, P. B., Lambert, C. T., Gordon, N. F., Fletcher, G. F., Franklin, B. A., Wenger, N. K., & Sperling, L. (2015). Cardiac rehabilitation and risk reduction: time to “rebrand and reinvigorate”. Journal of the American College of Cardiology, 65(4), 389-395.